A couple weekends ago, I did a cooking demo at the Minneapolis Farmers Market called "The Ravishing Rutabaga - or - It's Not a Turnip, People". The goal was to share recipes that celebrate a vegetable that I love deeply, but I feel is often misunderstood and underused! It was a gorgeous day for the demo, becoming warm and sunny as the morning went on, and it was very well attended by fellow bloggers, cooks, friends, and passing shoppers interested in learning more about our earthbound vegetal friend. I wish I could give cooking demos everyday. I shared three recipes with the crowd - a crunchy raw rutabaga salad, mashed rutabaga and sweet potato, and a rutabaga cake. It was awesome! So, I wanted to share the recipes with you too, plus another bonus recipe that I love. I only have photos of the rutabaga salad, so use your imagination! The rutabaga is a delicious, nutritious, and versatile vegetable that is perfect for fall and winter cuisine. Wonderful raw or cooked, it is high in vitamins, is a good source of complex carbohydrates, and contains naturally anti-microbial and anti-oxidant properties. Don’t know what to do with it? No worries! Here's a bunch of information, flavor combinations and four easy recipes featuring rutabaga that will surely make you a fan. As a side note, I might be a bit absent the next few weeks. I'm having a flare-up of Lyme symptoms, my internet access at home is gone, and I'm moving to a new place in a few weeks. I'm busy and not feeling well. So, I'll be posting round up and kick-offs for the next SOS Kitchen Challenge, but might not be post much else the next few weeks until I get settled in in my new place and am hopefully feeling a little more sprightly. Rutabaga, also called Swedish turnips or Swedes, are a members of genus Brassica, like turnips, cabbage, cauliflower, kale, collards, broccoli, and other crucifers. The rutabaga, believed to be a hybrid of the turnip and some form of cabbage, has a much more recent origin than the turnip. Some authorities say rutabagas are native to Russia and Siberia, others that the new species was first found in Europe some time in the late Middle Ages and probably originated in Scandinavia. It is said there was no record of the rutabaga until 1620 when the Swiss botanist, Casper Bauhin, described it. The word "rutabaga" comes from the Swedish "rotabagge." The rutabaga became a popular vegetable throughout Europe among peasantry and royalty alike. In fact, they were grown in the English royal gardens in 1664. Eventually, the rutabaga found its way to the New World, where it was known as "turnip-rooted cabbage." The rutabaga is often confused with the turnip, but there are many differences. Rutabaga have a sweeter flavor, grow to be larger in size, and often have a more elongated shape than turnips. The leaf has no hair and is fleshier than the turnip. Also, the rutabaga has a longer ripening period. The rutabaga has dense flesh that is starchier than the turnip, and is most often a golden yellow color. Like turnips, rutabaga grows best in colder climates and is principally cultivated in the northern latitudes. When selecting rutabaga, choose ones that are firm, weighty, and fairly smooth, with few leaf scars around the crown and with very few fibrous roots at the base. Soft or shriveled rutabagas are undesirable, because they will be tough when cooked. Because rutabagas store so well, up to one month in the refrigerator and up to four months in commercial cold storage, they are available year round. Planted in May and June, they're harvested in late summer and early fall when their flavor is at its peak. Ideally, it's best to shop for fresh rutabagas at farmer's markets in early autumn. In Minnesota, rutabaga is in season in September, October, and November, as well as early spring if wintered over. The rutabaga has a strange assortment of activities and traditions as well. Rutabagas are commonly carved into decorative lanterns called jack-o'-lanterns for the Halloween season throughout Britain and Ireland. The International Rutabaga Curling Championship takes place annually at the Ithaca, New York Farmers' Market on the last day of the market season. Rutabaga Festivals are held annually in Askov, Minnesota, Cumberland Wisconsin, and Keene, New York. Rutabagas are high in fiber, complex carbohydrates, vitamin C, potassium, and manganese. In fact, 1 cup of cubed rutabaga contains 4 grams of fiber and over 50% of the daily recommended intake of vitamin C. They also contain smaller amounts of many fatty acids, vitamins, and minerals. Like all Brassicas, they containdithiolthiones and sulfur, which have antioxidant, antibiotic and antiviral characteristics. Because of this, rutabaga help boosts the immune system, may help prevent cancer, spina bifida, and heart disease, and arean excellent choice if dealing with recurring viral or bacterial infections. Rutabagas are sometimes recommended for cases of constipation. However, because of their mustard oil content, they may cause gas, especially if eaten raw. Rutabagas can be eaten raw or cooked, and can be prepared in a multitude of ways. They should always be peeled before consuming. The greens can also be eaten. Prepare them like turnip greens or other dark leafy greens like kale or collards. Most rutabaga that are sold in conventional grocery stores are waxed to increase the shelf-life; find unwaxed varieties at farmers markets, natural grocers, co-ops, and from the garden. I prefer unwaxed. Throughout Scandinavia, rutabaga are used in a variety of ways. They are often roasted to be served with meat dishes, in soups, in traditional Christmas casseroles, uncooked and thinly julienned as a side dish or in a salad, baked, or boiled. It is common to boil them with potatoes or carrots, mash them, and serve them with cream and butter throughout Northern Europe and the UK, sometimes with onion added. In Scotland, rutabaga are traditionally served with the national dish of haggis as the main course of a Burns supper. In Canada rutabagas are used as filler in foods such as mincemeat and Christmas cake, or as a side dish with Sunday dinner in Atlantic Canada. In the US rutabagas are mostly eaten in stews or casseroles, served mashed with carrots, or baked in a pasty or vegetable pie. 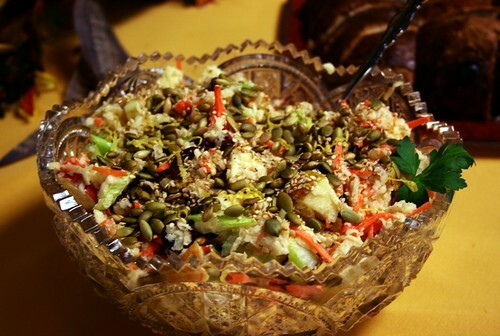 Colorful, sweet, and crunchy, this salad is a delicious accompaniment to any meal, and is awesome for potlucks and parties because it makes a ton. I've made it a million times over the last couple of months, sometimes omitting the currants, swapping out pumpkin seeds for sesame seeds, and omitting the maple and using some English Toffee Stevia ilquid instead. Everyone who tries it loves it! Susan Powers from the blog Rawmazing (and a fellow farmers market demo presenter) came to the demo, loved the salad, and posted her version of this salad here - check it out! This recipe is linked to the October SOS Kitchen Challenge, sponsored by Ricki from Diet, Dessert, and Dogs and me, which features sesame as this month's featured ingredient. This month's challenge is being sponsored by iHerb. They are offered 1 pound bags of sesame seeds to the first 10 readers who submitted recipes and set up an account with them, and at the end of the month we will draw a name for a $50 iHerb shopping spree. Pretty awesome, right? Head over to this month's kick-off post to read all the rules and details, then submit a recipe to the Linky. You have until October 31 to submit a to be eligible for the $50 shopping spree!!! Lightly toast sesame seeds in a dry sauté pan over medium heat until golden and fragrant, about 3-5 minutes. Set aside and let cool. Grate rutabaga with a large-holed grater or a food processor. Toss with chopped apples and 2 Tbsp of lemon juice, to prevent browning, in a large bowl. Add grated carrot, sliced celery, and raisins/currants, and stir to mix. In a medium bowl, whisk together tahini, maple syrup, and lemon juice, then add water and continue to whisk until smooth. Add sea salt and nutmeg and whisk again. Drizzle dressing over salad, and stir to combine, then add sesame seeds. Serve at room temperature or chilled. Keeps well for 2-3 days in the fridge. This mash is decadent and delicious, scented with vanilla bean seeds and garam masala, and garnished with bacon. Garam masala is a fragrant Indian spice mixture. Although there are many regional variations, the most common ingredients are cinnamon, cardamom, nutmeg, cloves, coriander, and black pepper. Look for vanilla beans and garam masala in the spice section of well-stocked grocers or specialty spice shops. Peel rutabaga and sweet potato, and cut into 1 ½” cubes. Boil cubes in lightly salted water for 20-25 minutes, until fork tender. Drain, reserving 1 cup of the cooking water. Slice vanilla bean lengthwise, and scrape out seeds with a small knife. Place cooked potato and rutabaga cubes in a food processor and process until smooth, or, place in a large bowl and mash with a potato masher. Add small amounts of reserved cooking water if mashed vegetable mixture is too thick. Then add vanilla bean seeds, nutmeg, and butter, and process/mash until fully incorporated. Add salt to taste. If you desire an extra bit of sweetness, drizzle with maple syrup. Dice bacon. Heat a medium sauté pan over medium heat, then add bacon and cook until crisp. Remove from heat and place crumbles on paper towel to drain. Drain off some of the bacon fat, leaving 1-2 Tbsp in the pan. If using turkey bacon, which has little grease, add 2 Tbsp butter to pan. In a food processor, grate the rutabaga chunks and parsnips. Heat pan again over medium heat, adding olive oil to the bacon fat and heating until a piece of rutabaga sizzles. Then add the grated rutabaga and parsnips to the hot pan and stir to coat. Sprinkle with a generous pinch of salt. Sauté for several minutes until it gets a nice golden brown color. You may need to add a little more olive oil while it’s cooking if the pan gets too dry. Taste for salt and add more if needed, add a little pepper if desired. Serve hot, sprinkle with bacon crumbles. This sweet and spicy cake is cane sugar-free, gluten-free and egg-free, and can easily be made dairy- free as well. Xanthan and guar gums help bind gluten-free flours, which easily crumble when baked, and can be found in the specialty baking section of well-stocked grocery stores and natural food stores. If you tolerate gluten, see note below recipe on how to make with wheat or spelt flour. This cake is surprisingly delicious, and everyone at the demo really, really liked it. Preheat oven to 350º F and butter a 9”x9” cake pan. In a medium bowl, whisk together ground flax seed with milk/non-dairy milk, and let sit for 10 minutes to absorb moisture and thicken. While flax-milk mixture sits, whisk together flour, xanthan gum, spices, salt, baking powder, and baking soda in a medium bowl until light. Using a hand mixer, beat flax mixture until light, then add honey and melted butter, and beat until smooth. Mix dry ingredients into wet on medium speed until just moistened, then add rutabaga and apple and gently fold in by hand until evenly combined. Batter will be thick. Spread mixture into prepared pan, smoothing surface with damp fingers or a silicon spatula. NOTE: if you tolerate gluten and prefer to bake with wheat or spelt flour, omit xanthan gum and substitute brown rice flour and starch with 1 ½ cups unbleached all-purpose flour or spelt flour.